This circuit has been very useful in filling a header tank for a reticulated water supply on a farm. Eight troughs are supplied in different paddocks where a lack of water would have serious consequences for the stock. In the past, the tank had been filled daily by a time clock which was not successful. During hot weather, the stock would empty the tank on a regular basis and then be without water for several hours or the tank would overflow and flood the area if the weather was wet and the cattle did not drink much.1. The circuit described has been used to maintain the level of water in the header tank within prescribed limits. It controls a 3HP submersible bore pump which has a high starting current, necessitating a solid-state relay sufficient to take the starting load. Two Darlington transistors, Q1 & Q3, in conjunction with Q2 & Q4, are connected to the upper and lower water sensors in the tank. Q2 & Q4 have a common 5.6kO load resistor and function as a NOR gate. The output of the NOR gate drives Q5 which activates relay RLY1. Initially, when the water level is low, both sensors will be open-circuit, the NOR gate output will be high and the relay will be turned on. This causes the normally closed (NC) contacts of the relay to open and disconnect the lower sensor. 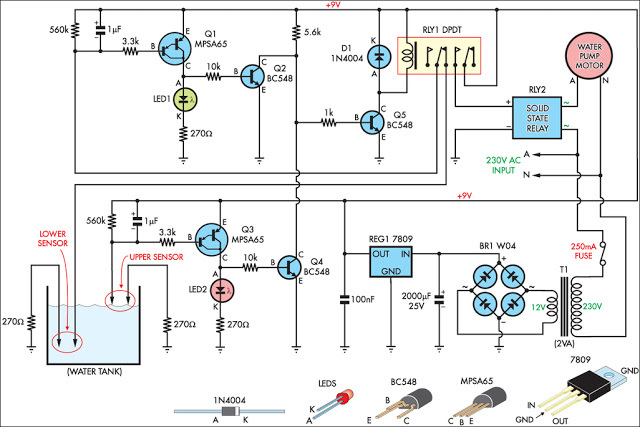 However, the upper sensor will still be open circuit and the NOR gate output will be high, keeping the relay closed. 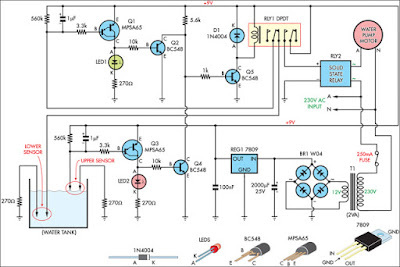 The normally open (NO) contact of the relay will be closed to operate the solid-state relay RLY2 to run the pump. This state continues until the water reaches the top sensor which will then drop the output from the NOR gate to 0V. The disables relay RLY1 and the pump is stopped. In practice the upper level sensor is just below the overflow from the tank and the lower sensor about half way up the tank. The sensor contacts are simply two stainless steel screws about 25mm apart and screwed through the poly tank walls. The wiring junctions on the side of the tank are protected by neutral-cure silicone sealant.